One of the latest design trends is Farmhouse style. It is rustic, natural and modern. Reclaimed wood and natural color tones are beautiful! Metal and farm animals add more to the farmhouse feel. All of this inspired Sean to make our new farmhouse wreath. An oval grapevine wreath with cotton bols and greenery are simple but look natural. 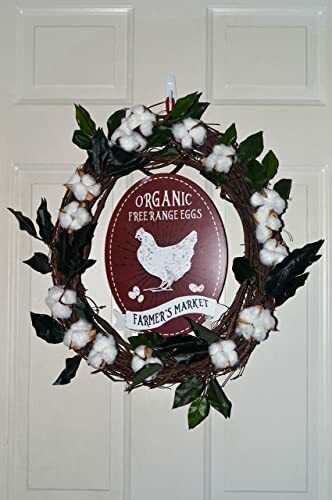 The farm fresh metal chicken eggs sign tie everything back to the farmhouse. The white of the cotton, the green of the leaves and red sign contrast beautifully and look like they were placed by nature. Our email subscribers saw this wreath 1st. Want to feel special and know about our new items or sales? Sign up for our email newsletter.